Azureus Software has released a brand new version of its Vuze client which allows users to merge swarms. The swarm merging feature can increase the number of download sources, bringing dead torrents to life and speeding up others. Vuze is one of the most recognized BitTorrent brands. The client is used by millions of people each day and has a steadily growing user-base. While it’s certainly not the most lightweight client around, Vuze has some interesting options for more demanding BitTorrent users. With the latest 5.6 release the new “swarm merging” feature stands out. The new feature allows users to find duplicate files shared elsewhere via BitTorrent, and combines the seeds and peers from multiple sources. “Vuze automatically detects when two or more of your incomplete downloads share one or more files of identical size and will attempt to merge the torrent swarms to download the file faster or, possibly, complete an existing file with bad availability,” Vuze explains. For example, if you download a copy of LibreOffice, Vuze can search for torrents that have the same files and combine these swarms. This is particularly useful when a torrent has no seeds or very few active ones. Below is a screenshot of one download being pulled from two swarms. In this case it’s downloading 1.2MB per second from the original torrent and an additional 1.0MB per second from the merged swarm. The merging feature makes use of Vuze’s swarm discovery tool and finds files through the Distributed Hash Table (DHT). It’s relatively primitive and based on file-sizes, but can be a life-safer nonetheless. Another new feature that’s worth mentioning is improved support for the anonymous I2P network. 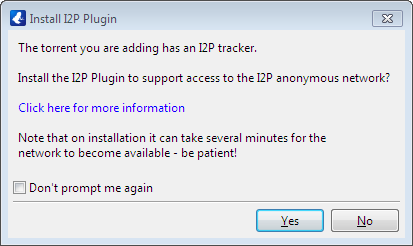 While not mentioned in the official 5.6 release announcement, users who download a torrent with an I2P tracker are now prompted to install the corresponding plugin. This I2P plug will likely increase the number of users on the network, increasing the download speeds as well. Vuze believes that it makes sense to support I2P as many of its users are interested in communicating anonymously. “I2P is used by many people who care about their privacy: activists, journalists, as well as the average person. The Vuze user can fall into all of these categories,” a Vuze spokesperson informs TF. The latest stable release of Vuze for Mac, Linux and Windows is available at the official website. More details on the swarm merging feature can be found in the Vuze wiki.